A garage-sized computer tomograph is in use around the clock at Porsche to detect almost invisible defects in vehicle components or materials. The diagnosis is clear: "The line is broken right here", says Ingo Vater, pointing at his monitor. A fine grey line passing through the 3D model of an oil line signals the location of the defect to the trained eyes of the Porsche employee in the quality assurance/tolerance management department. Vater rotates the model with the mouse, zooms in and then enters the defective component virtually. In other methods, the components usually need to be sawn open or destroyed in some other manner. "Our analysis is non-destructive in contrast", emphasised Vater. The actual oil line, which appears undamaged externally, was previously scanned by the engineer next to his workplace in a garage-sized computer tomograph (CT) clad in 50 tonnes of lead. "In principle, the function is identical to that used by a doctor, but we can also rotate our patients", explained Hendrik Höhe, the second CT expert at Porsche. With up to 450 kilovolt accelerating voltage, the X-rays are also around four times stronger than in medical systems. 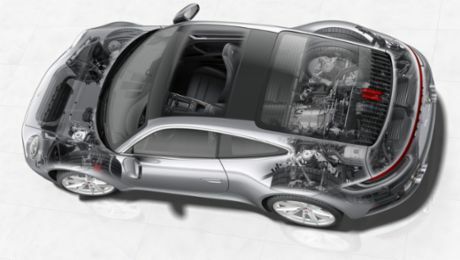 Since the computer tomograph was installed in 2005, the CT specialists in the research and development centre in Weissach (EZW) have processed over 4,000 orders and investigated the quality of more than 10,000 components for all Porsche series and prototypes. "In general, we can investigate everything that is not larger than one cubic metre and which can be sufficiently scanned", said Uwe-Alexander Müller, Head of Quality Assurance/Tolerance Management. Even the front cover of a 911 fits easily into the system. In principle, all materials and components can be scanned from development to series, irrespective of whether they are body, electric, chassis or drive components. However, although the system has recently been fitted with two new X-ray tubes and modern high performance processors constantly improve the options for quality inspectors, it still has its limitations. "This is mainly due to the achievable resolution of the system, because increasing requirements constantly demand even finer image details", admitted Hendrik Höhe. This is often the case with regards to new composites. "The LMP1 project is therefore a new challenge", explained Müller. This challenge is going to be mastered by a second system that has been in use in EZW since December 2013: A nano computer tomograph that can image minute details down to 500 nanometres (0.0005 millimetres) and which provides 20 times greater resolution than the current system. "With this nano-CT, we can visualise the finest of structures down to individual fibres in fibre composites and check their quality", said Vater. Even tiny electronic components, such as those used in hybrid vehicles, can be reliably analysed with this system. Another advantage of this increase in capacity: Waiting time in the CT centre has been significantly reduced. "The large system has been in use practically around the clock for years", explained Vater, "but because of the huge demand, some patients have had to wait two to three weeks before being scanned."